1. Open Configuration File: To Open an existing network (that was designed and saved earlier). Navigate to appropriate directory (default is "User" directory), and select the desired configuration file. Click the "Open" button in the dialog box to start working on the network diagram. 2. 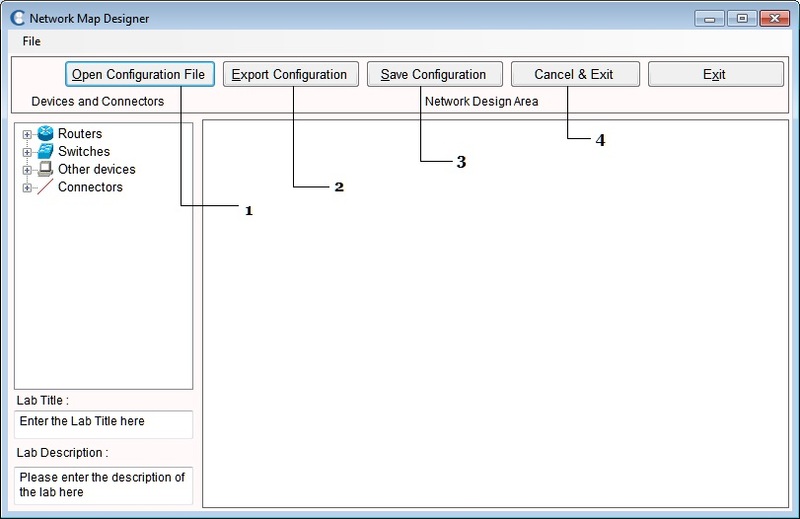 Save Configuration: After completing the network design, you need to save it. For this purpose, select the "Save Configuration". Note that the "saved file" and "exported file" have different file extensions and not the same. A saved file can only be opened and used in the network designer. An exported file can only be used by the network simulator. 3. Export Configuration: Once the network design part is completed, the network diagram along with the configured data (such as host name, ip address, and mask addresses) can be exported for use with the simulator. We can open this Exported file in the network simulator and configure it further according to the requirement. 4. Cancel & Exit: Use this option to exit the designer without saving any changes.